Campus is gearing up for a record-setting Orange Central. For the second straight year, more people than ever have signed up for Syracuse University’s annual homecoming and reunion weekend. Registration has grown by nearly 90 percent since 2016, with more than 2,300 alumni and friends pre-registered for this weekend’s festivities. The celebration kicks into high gear Thursday afternoon and continues through Sunday. Featuring more than 50 exciting and engaging programs planned, Orange Central truly features something for everyone. In addition to a number of milestone class reunions, there will be special affinity reunions for the following groups: Remembrance Scholars, past student-athletes, former Ottos, Marching Band, CitrusTV, Syracuse University Ambulance, Syracuse Abroad, University 100, and fraternity and sorority alumni. Syracuse University Alumni Awards Celebration: For the first time, Syracuse University has a spectacular awards show to call its own. The University will roll out the Orange carpet on Friday, Oct. 19, for the inaugural Syracuse University Alumni Awards Celebration, honoring SU’s talented and accomplished alumni across generations. The event—recognizing the 2018 winners of the George Arents Award, the Melvin A. Eggers Senior Alumni Award and the Generation Orange Award—kicks off with a cocktail party and wraps up with an after-party. ’Cuse Cookout on the Quad: This fun evening for the whole family Friday on the Shaw Quad features fall-themed food and beverages, a photo booth, games, a DJ, and caricature and balloon artists. Orange Central Tailgate: Get ready for the big Syracuse vs. North Carolina homecoming football game by enjoying delicious food and drinks on the Shaw Quad. The family-friendly event will feature great Syracuse giveaways, a photo booth, a visit from Otto, and a performance by the SU Marching Band. The festivities begin at 10:15 a.m. Saturday. Syracuse vs. North Carolina football game: The Syracuse University Alumni Association sold out of its allotment of tickets in the Orange Central Cheer Section, but specially priced Orange Central tickets are still available for purchase. 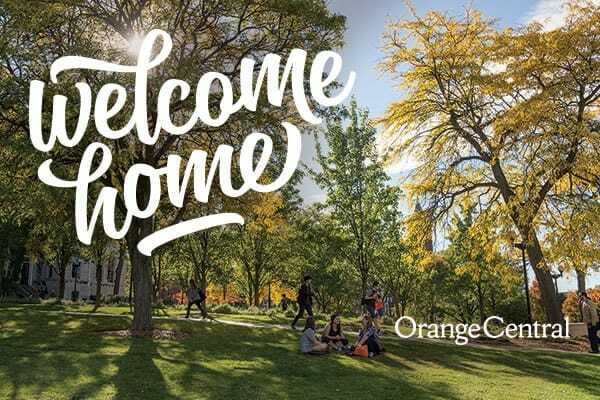 Milestone Reunion Celebrations: The Classes of 1958, 1968, 1974, 1993 and 2008, along with the Generation Orange (graduates of 2009 through 2018) Reunion Crew and Senior Citrus (graduates between 1938 and 1957) will celebrate milestone reunions at Orange Central. This is the first year celebrating a 44th Milestone Reunion (Class of 1974), paying tribute to the most significant number on campus: 44. Besides being worn by famous football legends like Jim Brown ’57, Ernie Davis ’62 and Floyd Little ’67, and basketball greats Danny Schayes ’81, Derrick Coleman ’15 and John Wallace ’12, 44 is intertwined in the Syracuse University fabric: all campus phone numbers begin with 44, and the zip code ends in 44. Online registration for the weekend is now closed. In-person registration will take place in the Goldstein Alumni and Faculty Center Thursday from 2-8 p.m.; Friday from 9 a.m.-9 p.m.; and Saturday from 9 a.m.-5 p.m. Questions? Call the Office of Alumni Engagement at 315.443.3258 or email orangecentral@syr.edu. To see the entire list of events, visit orangecentral.syr.edu.